Ethiopia’s first female president, Sahle-Work Zewde, delivers a speech at the Parliament in Addis Ababa, Oct. 25, 2018. Ethiopian lawmakers have appointed the country’s first female president, Sahle-Work Zewde. The position is ceremonial in Ethiopia. 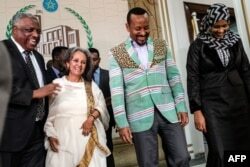 Nevertheless, the spokesman for Prime Minister Abiy Ahmed called the move “historic” and said it shows women will play key roles in Ethiopian politics. Sahle-Work’s appointment Thursday follows a Cabinet reorganization by Prime Minister Abiy Ahmed that resulted in women getting 50 percent of the government’s top ministerial positions. 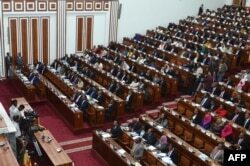 And women now hold 37 percent of Ethiopia’s parliamentary seats, almost twice the ratio of women in the U.S. Congress. Never before have Ethiopian women held so many high-ranking government positions. But stark gender disparities in the country persist, and it’s not yet clear how improved representation in the federal government will affect the status of Ethiopia’s more than 50 million women and girls. Sahle-Work Zewde (2-L) walks with Prime Minister Abiy Ahmed (2-R) after being elected Ethiopia’s first female president, at the Parliament in Addis Ababa, Oct. 25, 2018. After taking the oath of office Thursday, Sahle-Work said she sees a vital role for women in tackling society’s biggest challenges, in Ethiopia and beyond. “If the reforms we have started are led in equal measure by both men and women, the country will soon forget poverty and backwardness and move toward prosperity,” she said. The women in Ethiopia’s new Cabinet bring decades of government experience to their posts. Many have previously held lower-level ministerial positions, and most have advanced degrees in such fields as accounting, organizational leadership, law and gender studies. Ethiopia’s new defense minister, Aisha Mohammed, is the first woman to hold that position. Born in Berhale, Afar, in northern Ethiopia, Aisha studied civil engineering and held managerial positions for several years before becoming the minister for construction, along with the minister of culture and tourism. She also earned a graduate degree in transformational leadership and change. Aisha rejected the idea the new appointments are merely symbolic or only substitutes for deeper reforms. “All women who are appointed to the minister position have both education and experience,” she told VOA’s Amharic service. “We are weighed the same way the men are weighed,” she added. FILE - Ethiopia’s newly-appointed defense minister, Aisha Mohammed, arrives to take her oath of office on at the Parliament in the capital, Addis Ababa, Oct. 16, 2018. Despite recent political strides, women in Ethiopia face systemic inequities. In 2017, Ethiopia ranked 121 out of 160 countries on a U.N. gender equality index that considers various social, health and political factors. Discrepancies begin early and persist throughout many Ethiopian women’s lives. Female genital mutilation rates remain high, with 74 percent of girls and women aged 15 to 49 years experiencing FGM, according to UNICEF. Child marriage is prevalent, with 58 percent of women marrying before they turn 18. Nearly twice as many men than women over age 25 have some secondary education. And 88 percent of men over 15 participate in the labor force, compared to 77 percent of women. Overall, gender inequalities appear to be narrowing, based on national surveys, but significant gaps remain. Sahle-Work started her career as a diplomat, serving as Ethiopia's ambassador to Senegal, Djibouti and France. She has worked most recently with the United Nations, where she became the special representative to the African Union and the head of the U.N. Office to the African Union in June, making her the first woman to hold that position. FILE - Ethiopian lawmakers attend a swearing-in ceremony of newly appointed ministers at the Parliament in the capital Addis Ababa, Oct. 16, 2018. Women currently fill half of the country’s cabinet and 37 percent of its legislature. Speaking on International Women’s Day in March, Sahle-Work addressed the role of women in fulfilling the U.N. mission to end poverty, hunger and other major problems, concerns she might now strive to address in her new role.